Brexiteers like Boris Johnson inhabit an outdated form of sovereignty. A new realm of power - regulation - demands shared authority and is the EU's greatest achievement. Britain helped create it and can't leave it. Leviathan T-shirt thanks to Red Bubble T-Shirts. Regulation, reinforced by human rights, has become a new sphere of government. It is now as essential to modern society as executive power, legislative authority and courts of law. The way we experience this is also novel. It does not stem from the influence of politicians, the role of authority whether national or local, or fear of justice. These familiar locations of power continue, but a new force has joined them as our intimate lives have become strangely politicised, from our health and diet to our metadata. 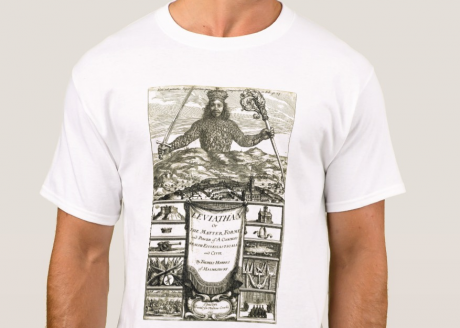 The famous frontispiece of Hobbes’s Leviathan shows the people inhabiting the ruler. Today, rules have entered the bodies of citizens - and we want to know who is in charge of them and whether they enhance or imprison us. Brexit forces into the open this change, which has been underway since the 1970s. In the UK, those who support Leave have failed to understand the epochal significance of its development, while those who back Remain have failed to articulate it. The European Commission, too, does not grasp its centrality. Brussels as well as Brexiteers are captives of 20th century notions of sovereignty and its unsustainable illusions of grandeur - illusions that are now being tested to their destruction, most immediately with Brexit. I stumbled across its significance of regulation and am only beginning to get a measure of it. Denunciation of the EU’s over-regulation was the starting point of the long campaign against British membership. Now, a revealing analysis in openDemocracy reports staggeringly high rates of popular support in the UK for European levels of regulation. They run at between 70-80% - incorporating large majorities of those who voted to Leave. While the big boys bang on about sovereignty, regular people, women somewhat more than men, prefer regulation. Brexit has a weird, old-fashioned veneer because it is so male-dominated and self-important, giving the issue its end of epoch feel. The campaign against it risks being drawn into similar routines and perhaps recognising the centrality of regulation can help prevent this. The significance of regulation came home to me when I recently attended a meeting with a senior member of the Cabinet who is an influential Brexiteer. The UK government will leave the EU, he said confidently, and no longer submit to the ECJ, the European Court of Justice. However, it would seek 'association agreements' with respect to nuclear materials, air travel, pharmaceuticals, automobiles and chemicals. Such agreements would have ECJ oversight. All international agreements necessitated arbitration, he told us, helpfully. The rules would be accepted at every point in the production process. When someone said such ongoing arrangements would come at a high cost, he nodded assent. In effect, the Brexiteer told us, all our manufacturing needs to be within the aegis of the EU’s regulated space. Shortly after Open Europe, which is directed by Brexit-supporting Henry Newman who once worked for Michael Gove, published Striking a Balance, a report that recommends an across-the-board agreement on these lines. Its justification: “The EU is our most important goods’ market and the most highly-regulated sectors – electrical, automobiles, and chemicals – are the areas which we trade most with the EU and are growing the fastest”. Unlike Boris Johnson, who I'll come to in a moment, Brexiteers who study the evidence want the UK to be in the Single Market for goods. The government will apply “to stay in the European standards system for industry products and services”. It is easy enough to ask, as we should, what, then, is the point of Brexit? Another good question is whether the EU will agree to the request. I want to ask why even passionate Brexiteers now see no way out of the EU’s regulated space, certainly in traded goods. The crux of the answer is that that there is no way out of regulation. By regulation I don’t just mean high profile financial regulation. I mean its ongoing, background role in ensuring the quality of the air we breathe, the medicines we take, the food we consume and the safety of the flights we board. You could undertake the enormous costs of building custom checks for goods going between the UK from the EU. But what is the point, if you then have to recreate and duplicate inside the UK the entire apparatus of regulations, with their ongoing autonomy from parliamentary 'sovereignty'? The idea that once the UK left the EU Britain could ‘do away’ with regulation from Brussels, because it is mostly unnecessary, has proven to be an utter fantasy. Britain’s wannabe Donald Trump, Nigel Farage, told the BBC, “we will finish up perhaps in an even worse place than we are now because we won’t be free to de-regulate”. But no modern democracy would wish to deregulate. It is not the road to freedom. And as the UK government is learning, public opinion will not let it deregulate. This is a fundamental lesson of Brexit. The lesson is related to, but goes further than, Will Davis's notable response to the referednum result in 2016. Drawing on David Graeber's The Utopia of Rules, Davis emphasised that in an important way "capitalism is regulation" and concluded that the ideology of Brexit is illusory. In the UK, these dire, Brexit-times have bred impatience, shallowness and lack of reflection. I want to resist these and examine an activity which may seem petty and irritating but isn’t. A misconception needs to be undone, an everyday prejudice that certainly had me in its grip, and has blinded us to a reality that cannot be escaped. To comprehend why I will start with a glance at the conceptual inheritance embedded in the notion of sovereignty itself. It makes for a long article but the reward is that I will show it is impossible to ‘take back control’ in the way the Leave campaigners promised. They are living in the past. It is desirable and possible for countries to retain lots of democratic legislative, executive and judicial independence within the European Union. But with respect to the new, fourth branch of government we are hard-wired into a union of regulation. Something that is also, and not incidentally, to our huge mutual, personal and bodily benefit. The dominant, early modern justifications of state power, from to Bodin to Hobbes, were concerned with the absolute nature of sovereignty, how to justify it, exercise it and ensure consent. In the eighteenth century the concept of the separation of powers was developed, most notably by Montesquieu. He looked at the nature of government not from the point of view of the ruler but from that of property owners. They needed good, strong government to ensure their rights. They also needed to preserve their privileges from the danger of such government becoming a tyranny over them. Montesquieu's solution was to elaborate on the way government involves three forms of activity: the legislative, the executive and the judicial, and to argue that their seperate autonomy was essential for the preservation of liberty. Each would check the others and thereby protect society from arbitrary power. Thus the executive (whether a monarch or those ruling in a monarch’s name) could not tax or expropriate except with the agreement of the parliament or assembly and only then within the rule of law. The extreme nature of the separation of powers in the United States proved exceptional. Even there, they overlap and interact. Congress approves presidential appointments to the Supreme Court. Currently it does so on party lines and as a consequence the court has become politicised - in effect its independence is diminished more than in many European constitutions. The practical reality of the three functions became the matrix for describing other law-based systems. In Britain, Bagehot, in his famous mid-19th century account of what he called The English Constitution, praised the efficient way the Cabinet 'fused' executive and legislative power, so that members of the legislature exercised executive government. The legacy of this undivided sovereignty remains central to the trauma of the Brexit referendum. In practical terms, the Victorians feared the consequences of the all-powerful fusion, should the extension of the franchise bring the unwashed to power. They ensured the independence of the executive arm by creating a permanent civil service that could not be replaced by an incoming government. But the mentality of parliamentary absolutism defined the horizons of the British system. In 1885, in what became its defining tome, The Law of the Constitution, A.V. Dicey described it as "the despotism of the King in Parliament". He summarised a tradition that goes back to Hobbes, whose Leviathan in the same famous frontispiece holds the public sword "unconstrained". To this day this remains, "the very definition of sovereignty" in the United Kingdom. We have not left centuries of history behind us. Not so in most of Europe, where the earlier tradition of constrained power re-emerged in the codified constitutions of the later 20th century, creating a tide of protection and extending the rights of citizens. In a grim article in Prospect, Vernon Bogdanor analyses and laments the UK's looming loss of rights if it abandons the 'protected' constitutional model of the EU to revert back to Hobbes. It is a traditional argument well put but insufficient. Today, we are surrounded by a new kind of agency that does not oversee the exercise of power, judge who breaks the law or administer the armed forces or public services. Instead these agencies regulate. If you embrace the Hobbesian, Westminster notion of the state, as Brexiteers do, then power is zero-sum. Either one has it or the other does. In contrast, the powers of regulation are an exercise in mutual collaboration with the aim of collective gain. The process is win-win not win-loose. For the Anglo-British this cannot define the nature of power - because sovereignty cannot be shared, it can only be singular. There are endless examples of this taken-for-granted assumption across the commentariat, both Remainers and Leavers. To take an example at random, Oliver Wiseman, the editor of CapX website, says he prefers "the return of powers from an undemocratic supranational organisation to a democratic national government”. The assumption: that power is something you have or do not have and it can be returned. But in many fields there is no such possibility. The power of regulation resides in relationships that are negotiated. The process needs to be democratised but it can't be 'returned'. The underlying premise of Brexit is that sovereignty is simple. It is not. If it ever was, it isn't simple now. It is complex, multi-layered and in the age of corporations no longer something nation states can monopolise over their territory. Hence Brexit cannot be 'Brexit', as in Boris Johnson's call for a "full British Brexit". Sovereignty is no longer a meal we can eat alone. I owe much of my thinking about what has happened to Frank Vibert, author The Rise of the Unelected and The New Regulatory Space, Reframing Democratic Governance. He describes how over the last half-century unelected bodies, from economic regulators, to science and medical councils, and now digital watchdogs, backed by a new range of auditors and ‘risk managers’, have proliferated. Democracies need regulation for a wide variety of reasons that have grown out of an increasingly complex, science-based, long-range market-place. New relationships are being created between the state and the market, while ethical questions of safety, accountability, privacy and consumer and employee rights have emerged. The internet and the explosion of digital platforms has intensified the process greatly. Regulation goes back to the first British Factory Acts. It was strongly developed in the USA in the New Deal to rein in business. In 1991, Cass Sunstein wrote a pioneering account of this in After the Rights Revolution, Reconceiving the Regulatory Space and attempted to set out legal principles to govern regulation within the framework of the US constitution. This year, Paul Tucker, who was deputy director of the Bank of England, published a massive, thoughtful account, Unelected Power: the quest for legitimacy in central banking and the regulatory state. He argues that it is dangerous for democracy if regulation over-reaches itself to become a fourth branch of government and he sets out principles to ensure it remains accountable. His arguments are echoed by David Currie, outgoing chairman of the Competition and Markets Authority. In a valedictory lecture he emphasised how its regulatory power is wholly independent of parliament and ministers and is deployed “even when no one is breaking the law” to investigate whole markets (such as the price and practice of funerals). Yet because its authority is set out by parliament and subject to judicial review, Currie sees it as subordinate to the traditional structures. A parallel example would be the way ‘cyber-space’ has now added a new dimension to land, sea and air, without replacing them. We live in the same physical world as the twentieth century but not in the same way. Regulation has become a parallel form of authority over how we live. This has enormous dangers. We now need to ensure it answers to citizens democratically; which in turn presents a new kind of constitutional challenge that will not be met by traditional political responses. Otherwise, our democracy, such as it is, could be replaced by hi-tech dependency that subordinates us to a networked ‘social-credit’ regime of the kind being pioneered in China to pre-empt democracy there. With the danger comes the possibility of a more human, decentralised self-government. That is for the future. Here, I simply want to examine what it means in the present; starting with three perspectives: that of the law, for a single industry and for us as individuals. As of the date of a Brexit, the process of rulemaking and enforcement within these expert entities will not stop, and indeed should not stop, since new dangers will be identified, new products will be proposed, new licensing requirements will emerge and adverse events about existing products will be reported. To take one example, pharmaceuticals are today subject to successive tests in the laboratory, then on animals, then on healthy human volunteers, then on selected patients in order to demonstrate safety and efficacy. Once approved, the performance of the medicine is regularly monitored and apparent problems (adverse health events) reported, for corrective action to be taken. Animal feed in line with the advice of the Scientific Committee on Animal Nutrition is subject to comparable but lighter rules, as are food additives and cosmetics. It seems that the EU has in this way developed over 11,000 regulations, set over 60,000 standards and its different agencies have taken over 18,000 decisions on interpreting regulations and laws. Forrester notes that it could take ten years to incorporate them into British law, if each is accorded scrutiny. This alone shows that a process has been taking place that is beyond the reach and capacity of traditional legislatures. The result was acknowledged by the prime minister in her Mansion House speech in March when she finally set out ambitions for Brexit, “the UK will need to make a strong commitment that its regulatory standards will remain as high as the EU’s”. The continuous development of the rules that we need, to manage the dangers of science-based progress that we enjoy, can’t be legislated by traditional parliamentary institutions or overseen by traditional executive power. Regulation is an ongoing process of investigation, consideration and enforcement, different from both while it also has a quasi-judicial role. This is now integral to the everyday life of government in an age of international trade. We live in a regulated world. A lucid, two-page letter in December last year explains why we live in a regulated world, from the viewpoint of just one critical industry. It is addressed to Michael Gove as the Secretary of State for the Environment. The author is Steve Elliott, Chief Executive of the UK’s Chemical Industries Association, a sector, he points out, that is “the UK’s largest manufacturing export earner”. Ten years ago, the EU created REACH (Registration, Evaluation, Authorisation and Restriction of Chemicals), whose landing page explains its regulatory aims and justification. When it was set up, Elliott admits, the industry “was very concerned about the regulatory/testing costs”. Now, he reports, while imperfect and in need of changes, they have embraced it. It has worked, and is setting global standards that customers want. He makes a strong “plea” that the UK remains in REACH, sketches some of the chilling costs of leaving, and points out that if it does, given the huge importance of the EU market, his members have to respond to “two regulatory bodies”. This would make a “mockery” of the “regulatory simplification” promised by Brexit. Why two? Because here in the UK the chemical industry needs and desires regulation and would have to create its own version of REACH: “our industry would wish to highlight that it recognises the need for robust regulation. We are a high hazard sector and it is only right that we are regulated accordingly, giving confidence to our workforce, our local communities and consumers of our products”. In terms of what passes for the debate about Brexit, it is important to register that there has been no serious, counter-argument to the detailed, reasoned case, based on the realities of regulation. No one, therefore, can be in any doubt about the imperative need for a regulatory regime outside normal, parliamentary legislation and the impossible costs, practical and financial, of attempting to duplicate one. No one, that is, unless you are Boris Johnson oblivious to evidence. It is striking, watching Johnson in action, how he is unable to move on from the referendum campaign of 2016, that he led. You would expect after two years that his advocacy of Brexit would be more than hot air. Instead, it is as if he already knows that it was the high-point of his influence and he clings to its tropes and his now wearisome bonhomie. In a diatribe to fellow MPs, leaked to Buzzfeed, the man who is its Foreign Secretary attacked his own government’s negotiations in case they end up, as he knows they must, with the UK “locked in orbit around the EU…and not having freedom with our regulatory framework”. The casual suggestion that Britain can benefit from the “freedom” to regulate for itself shows Johnson’s lack of seriousness. This is confirmed by an article in the Sun on the second anniversary of the Referendum. Johnson demands, "the freedom to bust out of the corsets of EU regulation and rules - to do things our way" and not "some perpetual pushme-pullyou arrangement". There is not a scintilla of evidence that he has read the letter from the Chemical Industries Association or similar ones from every sector of industry, or from Japanese and European foreign investors, with respect to regulation, or even that he absorbed what the prime minister said in her Mansion House speech when he sat in front of her. Gove at least appears to have registered the evidence. Yet Brexit is personified by Johnson more than anyone. What does regulation mean for us as individuals? I’ve cited various experts and regulators and quoted a judge and the spokesman for the chemical industry. All this associates regulation with top-down authority. But the strength and vitality of the regulatory transformation of government is rooted in popular demand. There are two reasons why this is not obvious. Wealthy, speculative enemies of good government have funded the populist drumbeat attacking ‘regulations’ as ‘elitist’. Second, in our everyday lives, while we worry about the purity of what is sold to us, we only think about regulation when something goes wrong. This needs to change. We need to be able to challenge and improve regulation when it is clumsy, stupid or disempowering - to do so we need to make regulation democratic. Today, we rely on regulation. Back in the mid-twentieth century Britain if you wanted a take-away meal you might go to a locally owned chippy and pay cash. Today, you are just as likely to order and pay for it over the phone or even online, from a pizza chain. In doing so you have a set of expectations. Even if these do not include concern for working conditions in the kitchens and for the delivery workers, as they should, you will certainly expect that your card details are secure and the food healthy. The latter is especially important as those fullfilling your order may be temporary employees with no direct responsibility for the content of what you are eating. You do not want state surveillance of your activity. But in the background you expect it to have ensured oversight of banking and payment systems and rules about what goes into our food. We expect official standards to be in operation in the background of our everyday lives in a way that is historically novel. Even for simple activity. Previously if you were poor you wrapped a cloth around your hand to take something out of the oven, should you be cooking for yourself and your family. Now we buy oven gloves. We do not expect these to melt or burn easily. If they contain synthetic materials these must not be emit toxic fumes if singed. If you want free trade in oven gloves they could be made anywhere. Standards are required so that wholesalers know that even the cheapest are minimally safe. This requires regulation. In Trump’s United States, the corporate lobby holds sway. It has just been reported, the chemical industry has “scored a big win” and persuaded the Environment Protection Agency that when it assesses the use of dangerous chemicals it will “exclude from its calculations any potential exposure caused by the substances’ presence in the air, the ground or water’”. Think about that. However callous the USA, at some point its victims will capture popular sympathy when it suffers its version of Grenfell Tower, which now stands as a witness to the consequence of permissive deregulation. As the fridge caught fire in Flat 16 of the fourth floor of Grenfell Tower on the 14 June 2017, it sucked a whirlwind of inadequate, flawed, ill-enforced regulation and cuts in fire-brigade risk assessment and enforcement, into a murderous inferno. It was nothing to do with the EU but it would never have happened had the EU set the UK’s building standards and their implementation. “The root cause of this shift was simply that there was – and indeed still is – no public appetite for a deregulatory agenda. Our own polling with Opinium has found widespread public support for some of the most controversial EU-derived employment, environmental and financial legislation… Renewable energy targets – another bugbear of earlier Eurosceptics – are endorsed or considered too low by 74 per cent… more than 80 per cent of the public are opposed to lowering food safety standards. When confronted with this wall of public opinion, it is no surprise that leave campaigners adapted their position as the referendum date neared”. The anti-EU campaign is one of the strangest on record. It began by demanding an end to European regulation while increasing trade with the EU. Its triumph has led it to embrace less trade with the EU while retaining its level of regulation! But when it comes to 80% you can’t argue with “the people’s will”. Or as Theresa May put it in har Mansion House speech that Johnson praises but ignores, in "areas like workers’ rights or the environment, the EU should be confident that we will not engage in a race to the bottom in the standards and protections we set. There is no serious political constituency in the UK which would support this – quite the opposite". fundamental misunderstanding [is] about the single market, ironically since Britain was in large part its architect. The core of that misunderstanding is to regard the single market as an economic entity or international trade area whereas, in fact, it is more precisely a regulatory entity and area. It is this which has enabled the EU to dismantle non-tariff barriers to trade, including trade in services, in a way that goes beyond anything that exists anywhere else in the world. But, inevitably, this entails a shared legal and political infrastructure. How else can market-wide rules and regulations be made and enforced? The failure to understand this basic definitional fact, allied with the ‘in 1975 we were told it was just a trade bloc’ myth, gave rise to all of the ‘bendy banana’ type stories that ended up with the ‘take back control’ slogan of 2016. The correct way to think of the EU in economic terms is as a “regulatory union”, with the appetite and ability to extend its rules extraterritorially: the so-called Brussels effect. The EU is a superpower in no other respect. But in this critical one, it is. And the idea that, on its own, the UK, can compete with massive regional trading blocs – the EU, the US, China – as a standard setter, on industrial goods to data, is an illusion. And leaving a regulatory union, including a Customs Union is really much more difficult than leaving a free trade area. We have to go further. The way to think about the EU in terms of constitutional sovereignty is as the European union of regulation. This is its core achievement and greatest attainment. It is so fundamental that whether or not the Euro survives, and however much the Union may fail on critical issues like migration, it is not going to break up. It has achieved an enormous, ongoing material and human advance by responding to the need for the new and now essential domain of government. Why hasn’t the significance of regulation for the EU been recognised? Routledge have just published a densely researched Handbook on Brexit, edited by Patrick Diamond, Peter Nedergaard and Ben Rosamond. It has 23 scholarly articles and aims to set out a “systematic academic overview” of the Brexit process. They encompass the special character of the British state, the English and Irish questions, the role of the city of London, the flaws of the EU and the need to rethink theories of its nature. But regulation only figures as an aspect of financial policy for the City of London. The respected Centre for European Reform published a 50 page overview of how to Relaunch the EU in November last year. It is sober, thorough and addresses the need to make the EU more responsive. But it does not mention regulation or the need to make this accountable. The arguments that Vibert has developed remain peripheral to mainstream thinking. There is a prejudice against regarding regulation as anything other than a secondary activity or an add on. This extends back to the origins of the EU’s creation of itself as a regulatory space in the 1980s. In his classic account of the EU, The Passage to Europe, Luuk Van Middelaar recounts that when Jacques Delors was appointed President of the Commission in 1984 he was ambitious to create a sovereign Europe. He toured the capitals of the then EU to see if they would support a unified army, a common currency, or institutional reform. Instead, they only shared an interest in an improved internal market. Quotas and tariffs had been banned but a “maze” of rules and regulations prevented trade. A disappointed Delors accepted what he could get. He applied the EU’s approach pioneered by its founder Jean Monnet, aptly described by Perry Anderson as “incremental totalization”. Delors proposed an 8 year timetable of 300 legislative measures each member state should adopt to create what we now know as the Single Market. The Commission’s paper justified this to itself, explaining, “Economic integration has to precede European union”. As Middelaar dryly comments, “Europe was escaping into low politics again, while longing to engage in high politics”. Regulation was regarded as the dull but necessary preparatory work of the kitchen. The justification for it was the future feast in the dining room of global sovereignty. This may still be the hope for some. But the feast was and is a fantasy. Democratic nation-states are not going to fuse into a superstate. As the current President of the Commission, Jean-Claude Juncker, has just emphasised with respect to Italy, if only to shield the EU from responsibility for it, “A country is a country, a nation is a nation. Countries first, Europe second.” But meanwhile, in the kitchen, something else has been cooking, an autonomous continental-wide system of regulation that now provides many essential safeguards for Europe’s economies and consumers, whose standards for hazardous products and materials are becoming a benchmark around the world. Regulation is the Cinderella of the Union. Regulation is the Cinderella of the Union. It is despised by the stepmothers of the media, and obliged to undertake the routine chores while the Euro and its ugly sisters enjoy the silk sheets of endless attention. But midnight has struck for the ball of ever-closer union and super-statehood. On whose feet will the glorious slippers of the European Union fit, if not regulation? What are the principles we need to ensure regulation is answerable to us as citizens? Paul Tucker sets out some bold ones for first order agencies like the Bank of England, including clear mandates set out by parliaments. All bodies that undertake regulation should be independent of those whose activities they regulate. This might seem obvious, but regulatory capture is often the name of the game – especially when it comes to sweetheart auditing. The greatest recent scandal dramatically confirms the life and death need for robust regulation, outside of political control in an age of corporate power. The Volkswagen emissions disaster saw the German company sell eleven million cars that filled cities around the world with lethal nitrogen oxide fumes. Fortune published a gripping description of how this was permitted by the crony networks of German politics. At one point it describes how regulation was “watered down to the point of meaninglessness...[when] the German government amended its rules so that inspections of emissions performance would be based solely on readings from a car’s own ‘onboard diagnostic’ system, effectively ceding total control to the automakers”. It was also a grotesque failure by the EU to ensure independent oversight of testing. Another principle is that every agency should have a duty to explain itself in clear language to the public as well as the workforces and businesses directly affected by it. Such reports should also be subject to open challenge and questioning. Regulation must be answerable and should relish explaining itself, as a rational form of policy making with the public interest at heart. Only if different national publics are able to see that continental-wide regulation makes sense for them and is rooted in their own interests, will it be experienced as a gain of control and democratic mastery. An additional principle is needed to build on this. Regulation should protect and encourage diversity and empower responsible judgment - and not create costs that only corporations can fulfil. Like nature, progress consists of generating an abundance of variety. Sometimes the EU does achieve this. Thus its regulations for Protected Designations of Origins, EU 1151/2012 covers nearly 1,500 food products, from Stilton to Parma ham within the EU and without, to ensure that no description can suggest that products “originates in a geographical area other than the true place of origin...”. The democratic politics of regulation has yet to begin, outside of the Green movement. There is much to learn. But the fundamental point is that regulation must be brought out of the kitchen to be recognised as an extension of our democratic interests and intelligence, rather than being caricatured as the negation of self-government. For this to happen, the European Union and its Commission need to abandon their presumption that their calling is to replace national governments. Instead of regarding it as the dirty-work preparing the foundations for a super-state, regulation needs to be treated as the EU’s towering, irreplaceable achievement. One that assists national governments. On behalf of its member states the EU has created the new domain of sovereignty – regulation - with huge savings and advantages for all. Its accumulation of agencies, rules, and decision-making may seem to Brexiteers like the mere threads tying down the British Gulliver. But they are neither Lilliputian in strength nor chains of restriction: they are the inescapable and potentially liberating liaisons of a union of regulation. A union that empowers citizens across the continent, a union from which Britain should not wish to escape and, as we are now witnessing, cannot. Last month I published an open letter to my fellow Remainers in the UK about how to win the civil war that has broken out over Brexit. Millions of UK voters said Basta – enough! – when asked whether they wanted things to continue as they are. This was captured by the slogan 'Take Back Control'. To combat this we need a positive story about EU membership that engages with sovereignty and immigration as well as the combattive one attacking the oligarchs who back Brexit. This is not difficult for me because, while I'm critical of the EU, I regard myself as an English European. I delight in Europe and take an interest in how it and the UK are governed. When I wrote The Lure of Greatness in the aftermath of the referendum I forensically examined the decomposition of the British constitution thanks to the Brexit crisis and how resolving this is central to overcoming Brexit. But the vast majority of my compatriots including most of those who voted Remain don't yet share my interest in sovereignty and the constitution. Why, then, do millions show such stalwart, unwavering desire to repair the breach with the EU, while they remain indifferent to its institutions? Why do they regard Brexit as bonkers when they care little for Brussels and have no interest in how it works, apart from perhaps regarding it as tiresome and self-important? Something practical and not at all about the high institutions must be going on which has normalised living as part of the European Union. Something like the widely shared interview with a van driver who rang James O’Brien’s call-in programme and explained how Brexit would destroy his livelihood. Although no one uses such a mouthful, he was singing the praise of its shared regulatory space. Maybe, I thought to myself, I too have got too caught up in traditional notions of high politics and sovereignty while the nature of government has moved on. The defining ideologist of Brexit is the Daily Mail. It describes the main motive for leaving the EU as, “a deep-seated human yearning to recover our national identity and independence”. Must it be the case, then, that those of us who voted Remain are indifferent to, or have no yearning for, national identity and independence? I think not. I claim that we are more free in a fundamental way as persons - as English, Scottish, Welsh, Irish and British persons - inside the EU. Our liberty is enhanced within it, for all the dangers. You could answer that it is a false binary: that we can enjoy both patriotism and partnership, national identity and international regulation. Indeed, but such an answer takes a side. The spirit of Brexit insists on a single priority. For the Daily Mail our national identity and independence are being lost and must be “recovered”. It sees mass migration and the European Court of Justice as invaders that have penetrated our national space. It demands they be repelled to save our country and its great institutions. If judges show themselves to be “enemies of the people” and peers of the realm have become “traitors in ermine” they merely confirm how far subversion has reached. The Prime Minister shares this view. In her first speech to a Conservative Party conference as its leader she warned, “if you believe you’re a citizen of the world, you’re a citizen of nowhere”. This is the Daily Mail, Brexit point of view: our national identity is singular. The opposite, pro-European point of view has just been powerfully described by David Marquand: all of us have multiple identies. How, then, is it possible to share more than one identity and live with others who have their multiple allegiances - and not fall into the vertiginous vacuum of nowhere? How can the country – any country – hold together, if its people are not joined by the same, single “deep-seated, human yearning”? The answer is that regulation and human rights make multiple identities nationally feasible, by providing a practical framework for living together. They could hardly be more important for us. This is the second in a mini-series. The first is on the Brexit civil war. Next, The Brexit breakdown.